Publications - JASON A. LAKER, PH.D.
Pictured: Jason Laker (San José State University, United States, right), Dr. Concepción Naval (University of Navarra, Spain, left) and Dr. Kornelija Mrnjaus (University of Rijeka, Croatia, center) in St. Petersburg, Russia at an international conference, "Youth Participation as Goal and Method of Citizenship Education in Russia and Europe," hosted by the Centre for German and European Studies at Peter the Great St. Petersburg Polytechnic University (formerly St. Petersburg State University) in October, 2009. Their participation in this conference inspired the development of their two edited texts published in 2014, which also served as the foundational books launching the Palgrave series. ​​These two volumes contemplate the roles and methods of post-secondary/tertiary sector educational institutions in preparing citizens for meaningful participation in democracies, whether long-standing, young or emerging. 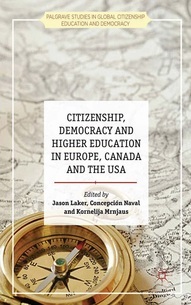 ​The first text, Citizenship, Democracy and Higher Education in Europe, Canada and the U.S. is organized into two thematic sections: Foundations and Frameworks articulates and examines the subject matter from a “big picture” perspective, describing the conceptual frameworks and sector roles involved in the project of citizenship education and development. The second section, Policy Environments, contends with the tensions, challenges and opportunities in assembling the components necessary for meaningful, inclusive and effective educational access and outcomes. 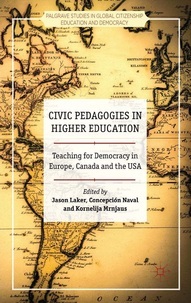 In the second text, Civic Pedagogies in Higher Education: Teaching for Democracy in Europe, Canada and the U.S.A., contributors offer case studies and best practices from the field, offering methodological and professional applications as well as lessons and recommendations arising from pilot efforts to promote students’ Democratic civic learning and engagement. This interdisciplinary reader is one of the only texts that explores men and masculinity issues within a distinctly Canadian context. Featuring seventeen original essays by leading scholars from a wide range of disciplines, this fascinating volume analyzes the many ways in which men and masculine gender roles have been constructed and depicted within Canadian society. Organized into three thematic sections, the text examines topics such as popular culture, sports, immigration, race, class, sexuality, ethnicity, religion, and other dimensions of identity, while considering whether 'Canadian masculinity' is particularly unique. Current and comprehensive, Canadian Perspectives on Men & Masculinities is essential reading for understanding the multifaceted and ever-evolving male experience in Canada. Masculinities in Higher Education provides empirical evidence, theoretical support, and developmental interventions for educators working with college men both in and out of the classroom. The critical philosophical perspective of the text challenges the status-quo and offers theoretically sound educational strategies to successfully promote men’s learning and development. Contesting dominant discourses about men and masculinities and binary notions of privilege and oppression, the contributors examine the development and identity of men in higher education today. This edited collection analyzes the nuances of lived identities, intersections between identities, ways in which individuals participate in co-constructing identities, and in turn how these identities influence culture. Masculinities in Higher Education is a unique resource for graduate students and professional post-secondary educators looking for strategies to effectively promote college men’s learning and development. ​Social Alternatives (Australia) ​Issue 35 (3) 2016 "Genders & Sexualities: Demilitarizing the Binary Beachhead"
Culture, Society & Masculinities Volume 5, No 2 (Fall, 2013) "Men and Masculinities in Higher Education"
Laker, J. (2019, forthcoming). Academic curriculum. In Tillapaugh, D. & McGowen, B. (Eds. ), Men & masculinities on campus: Theoretical foundations and promising practices. Sterling, VA: Stylus. ​Klobassa, V & Laker, J. (2018, forthcoming). Conduct and policy violations: Gender-informed restorative justice practice. In Catalano, C., Wagner, R. & Davis, T. (Eds. ), Gender-Aware Practices: Intersectional approaches to applying masculinities in student affairs. (New Directions in Student Services, No. 164). San Francisco: Jossey-Bass. Laker, J. & Davis, T. (2016). Unfinished business, dirty laundry, and hope for multicultural campus communities. In McClellan, G. & Stringer, J. (Eds.) Handbook of student affairs administration, 4th Edition. San Francisco: Jossey-Bass. Laker, J. (2016). What's a nice, straight, white guy doing in an essay like this?!!! Privilege, oppression and the binary politics of positionality. Social Alternatives. 35 (3), 57-60. Laker, J. (2015). The present state(s) and future direction(s) of gender. Troubling the binary beyond nature versus nurture. Education Sciences and Society. 6 (2), 13-19. Deželan, T., Laker, J., & Pavlin, S. (2016). What determines enterprises’ perceptions of future development in higher education – Strange Bedfellows? European Journal of Education. 51 (1), 107-125. K. Myers, Jason A. Laker, and C. Minneman. (2015). Subaltern supermen: Intersecting masculinities and disabilities in popular culture. In: Davis, D.J., Brunn-Bevel, R., & Olive, J.L. (Eds.) Intersectionality in Education Research (pp. 189-208). Sterling, VA: Stylus Publishing. Laker, J. & Boas, E. (2015). Compliance is simple, Consent Stories are complex: Building capacity for sexual agency as a prevention strategy. Journal of Campus Title IX Compliance and Best Practices. 1, 21-28. Laker, J. (2014, December 21). Review of the book How college works, by D. F. Chambliss & C. Takacs. Teachers College Record. Retrieved from http://www.tcrecord.org/content.asp?contentid=17794. Laker, J., Naval, C., & Mrnjaus, K. (2014). The folly of employability: The case for a citizen-driven market economy. Annales (Slovenia), 3 (24), 397-406. Laker, J. (2014, September 19). Physician, Heal Thyself: A brief manifesto on kindness in academia and the tyranny of legitimacy. [Blog] Impact of Social Science, London School of Economics and Political Science. Laker, J. (2014). Taking it Personally: Engaging democracy, human rights and civic participation as the vocations of higher education. In Laker, Naval, & Mrnjaus (Eds. ), Citizenship, Democracy and Higher Education in Europe, Canada and the U.S. London: Palgrave Macmillan. Laker, J., Holopainen, M., & Capizzi, L. (2014). The Personal is Pedagogical: A microcosmic conversation on democratic education. In Laker, Naval, & Mrnjaus (Eds. ), Civic Pedagogies in Higher Education: Teaching for Democracy in Europe, Canada and the U.S. London: Palgrave Macmillan. Laker, J. (2009, April). What should we be doing to end or reduce campus violence? Journal of College and Character, 10: 4. Laker, J. (2009, Winter). A call to community: Some thoughts for student affairs about identity and diversity. Communiqué (Canadian Association for College and University Student Affairs), 14-15. Laker, J. & Davis, T. (2009). Continuing the journey toward international and multicultural campus communities. In McClellan, G. & Stringer, J. (Eds.) Handbook of student affairs administration (pp. 242-264). San Francisco: Jossey-Bass. Laker, J.A. (2008, Summer). College males: Keeping them engaged on your campus. NASPA Leadership Exchange, 9-12. Laker, J.A. (2007). Review of the book: One size does not fit all: Traditional and innovative models of student affairs practice. Canadian Journal of Higher Education, 37 (2), 118-122. Kaufman, M. & Laker, J. (2007, February). Masculinity in the quad. Academic Matters: The Journal of Higher Education, 16-17. Laker, J. (2006). Ethical and practical considerations for developing institutional gambling policy. In: McLellan, G; Hardy, T.; & Caswell, J. (Eds.) Ahead of the game: Understanding and addressing campus gambling (pp. 73-82). San Francisco: Jossey-Bass. Berila, B.; Keller, J.; Krone, C.; Laker, J; & Mayers, O. (2005). His story/her story: A dialogue about including men and masculinities in the women’s studies curriculum. Feminist Teacher, 16(1), 34-52. Davis, T. & Laker, J. (2004). Connecting men to academic and student affairs programs and services. In: Kellom, G. (Ed.) Designing effective programs and services for men in higher education (pp. 47-57). San Francisco: Jossey-Bass. Laker, J. (2003). Bad dogs: Rethinking our engagement of male students. In Brown, P. (Ed. ), Men: On Campus. Washington: American College Personnel Association Standing Committee for Men. Laker, J. (2002). Disability and the social construction of masculinity. In Davis, T. (Ed. ), Men: On Campus. Washington: American College Personnel Association Standing Committee for Men. Laker, J. (Director/Producer) (2002). Man enough II: Disability and relationships [VHS Tape]. Tucson, Arizona: Wilkats Media Productions. Laker, J. (Director/Producer) (2001). Man enough: Disability and masculinity [VHS Tape]. Tucson, Arizona: Wilkats Media Productions. Laker, J. (Director/Producer) (2001). Permission granted: Men talk about sexual orientation [VHS Tape]. Tucson, Arizona: Wilkats Media Productions. Laker, J. (Director/Producer) (1997). Keep your distance: Images of male friendship [VHS Tape]. Newark, Delaware: University of Delaware Department of Communication.